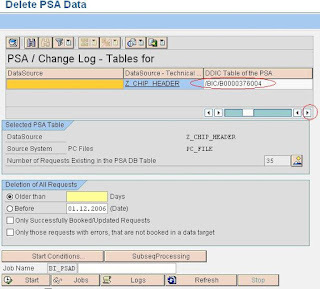 Martin Maruskin blog (something about SAP): How to search for the data in PSA – choice 1. How to search for the data in PSA – choice 1. Once you are working with SAP Business Warehouse (BW) your job is about data analysis most likely. 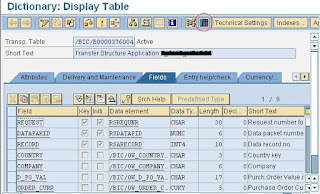 You need to find check the data in data targets (info cubes/ODSs) explore how data got into these objects, what is the transformation logic and when the bug is somewhere here to compare the data in source or in the PSA area with the data in targets. 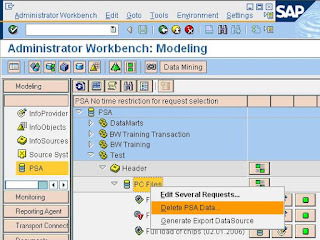 On next screen that appears scroll to right first section of screen and try to find field called “DDIC table of the PSA”. The content of this field is dictationary table of the PDA data. Here you can choose “Contents” icon or use keyboard shortcut CTRL+SHIFT+F10. SAP DB, mySQL MaxDB, whatDB? How to search for the data in PSA – choice 2.